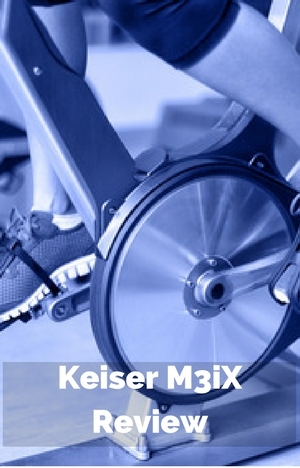 The Keiser M3iX Indoor Cycle comes with innovative handlebars. They move from side to side! You can work your upper body and lean into the corners. As you train or workout. Something you can’t do on most spin bikes or indoor cycles. It is the latest bike in the M3 Series and is proving very popular in the clubs. It certainly looks like you can an all over body workout which is better for burning calories and building up your fitness levels. As well as adding a more realistic movement to your training too. In this review I look at how well it performs as a standard indoor cycle or spin bike. I also look at how the added ability for you to have an upper body workout and lean into the curves when following along to a cycling video performs. I look first at how well it provides the solid platform need for a workout. The bike’s frame is constructed from steel that holds you firm while you workout in and out of the saddle. It doesn’t flex or shake – it holds steady. It has been designed for gym use and having the same frame as other models in the range that have stood the test of being used in gyms across the country and is proving very popular with the owners and their customers too. There are adjustable feet under the stabilizers to balance up the bike if you are using on an uneven floor to stop it rocking from side to side. It has been coated with a special paint to fight the affects of sweat. With the flywheel and magnetic resistance at the back of bike it also helps to keep them away from the sweat zones too so as to keep them from being corroded and/or jammed up. It has a reasonable warranty although I’d expected a longer one for the price when used for home purposes rather than commercial purposes. It has 3 years except for labor and wearable parts with a time limit of 6 months. Customers have found that the best range of heights the bike can be adjusted to fit properly are between 4ft 10 ins and 6 ft 5 ins. This is where the leg is slightly bent when at full extension to give full range of motion and to prevent possible pain and strain in the leg and a comfortable upper body position. The handlebars are different to the M3i in the adjustability of them. Their position can only be adjusted up and down unlike M3i (which can allow you to move them horizontally) and is more like the original M3. As the design of the bike provides a more angled adjustment of both the seat and the handlebars is 45 degrees (rather than straight up and down) it can cause there being more pronounced problems with getting the length right for people’s upper bodies as was noted with the M3. It wasn’t an issue for most but some found they had to stretch more than they wanted because of the distance and the seat adjustment wasn’t enough to compensate for it. The adjustment poles have marking on them which can give you a guide to adjust the bike to your size again if it has been moved since you last used it. Making the adjustments is easy. There are pre-set holes in the adjustment pole but you aren’t restricted to using them you can tighten into place in between if that gives a better fit. It does provide a safety feature if adjustment handle works loose while working out if only slips a little before engaging in one of the pre-set holes. The bike has 2 areas where resistance can be utilized – pedaling and the handlebars. The riding resistance is controlled using a lever just below the console. The level of resistance is shown on the console with there being 24 levels. The move up and down through the levels is incremental and smooth. It will cater for all level of fitness from beginners through to advanced (although some elite athletes may find it just a little light for some of their more advanced routines). Being able to see the resistance on the console helps to keep you on track with how hard you are working as allowing you to set and return to the amount of resistance you want to work out objectively without having to estimate it by feel as with many other spin bikes and indoor cycles. The resistance is very quiet and low maintenance. There is no need to replace the resistance as you have with resistance pads. The lower resistance levels can sometimes feel a little like you are in the wrong gear like when going down a hill and you have that feeling of trying to catch up, but aside from that it is a natural riding experience. You do need to concentrate more on your pedaling form due to a lighter flywheel. The handlebars that moves from side to side also have 7 different levels of resistance from easy to difficult. This helps you to build more core strength and burn more calories as you take it up to the higher levels of resistance. It helps in keeping you ready for when you are out on the road and generally in life too. The adjustment is done using a lever at the side to get to the level you want. It is easy to reach and move as you go. The bike comes with an 8 lbs flywheel which provides quiet and low maintenance workouts. The motion is smooth and consistent at all levels of resistance (as evidenced by customer reviews for the Keiser M3i Indoor Cycle). It’s not the same as you get with spin bikes with perimeter weighted flywheels that pull through the pedals to help to give a full 360 pedal motion. It doesn’t have that feel of the brake being on that you can get with friction pads. Instead you need to concentrate more on your pedaling motion to keep it at the full circular motion and doesn’t end up more of an up/down motion like you have on a stepper. Many do prefer this type of set up to the conventional spin bike set up. The bike does have a fixed gear so there is no ability to freewheel so when the flywheel is turning so are the pedals. To stop the pedals you can gently push back or to stop the flywheel quickly you push the resistance lever quickly away from you. It has double sided pedals that fit into a 3 piece crank. The crank providing the strength and durability needed for all that moving up and down on the pedals in spinning and mountain biking type workouts! On one side of the pedals is a toe cage and strap. You can slip your foot into the cage and tighten up to get a good secure grip on the pedals for pulling and pushing around the pedal stroke. On the other side is Schimano/SPD pedal for fitting specialist shoes that you can clip in to. There is no moving around or flexing of the pedals when pushing hard against the resistance in or out of the saddle. If you are used to riding an outdoor bike you are going to notice the Q Factor. It is 197 mm on this bike compared to about 155 mm for bikes. It has been compared to riding a barrel in comparison by a few. There can be concerns with the extra stress put on the joints due to legs not being aligned and for some it can cause an issue but for most it seems this isn’t an issue. If you have your own bike pedals you can use these as the bike has standard thread. Seat. Most find the contoured bike seat comfortable enough to train or exercise for as long as they want. But like any bike type seat you may not be so lucky. People tend to try padded bike shorts or a gel seat cover to help with the problem. If they don’t work you can try another standard fitting bike seat as it has a standard fitting that may be easier on your sit bones. Handlebars. The handlebars are covered to give you a good comfortable grip and have a good style to providing plenty of grip positions including the aero position. They aren’t cushioned and don’t have elbow pads so you are likely to have sore and/or aching arms after leaning on them. Noise. This is a very quiet bike. The only thing you’ll hear is likely to be your breathing from pushing yourself hard. If you want you can easily hear the TV or workout while others are sleeping without waking them up. You can then workout when you want. You don’t have to be concerned about your neighbors if you are in an apartment. Some people put the bike on a rubber exercise mat just to make sure nothing is heard in a downstairs apartment. Dust and Dirt. It’s not going to be adding too much to your cleaning chores. You should wipe it down to remove sweat so it doesn’t accumulate and start to corrode the bike. Sweat is also likely to drop on the floor and can damage that too. To prevent that from happening it is a good idea to put the bike on a rubber exercise mat. When not in use it needs an area of 26 by 49 ins. So it is likely to be too big for a closet but it is probably one of the best looking bikes around – almost like piece of art (although the x-bars do ruin it a little) – so won’t be too much of an eyesore to look at. The bike weighs 85 lbs but you don’t have to carry the bike when you want to move it. At the front of the bike on the stabilizer bars are two small transport wheels that you tip the bike onto when you want to move the bike. The bike is easy to tip and wheel where you want to go so that one person can do this. The wheels have plenty of room so should work freely on all surfaces except very soft or deep pile carpets. Also, these wheels can sometimes scratch or dent wood floors. So, before moving it all the way across a floor it’s a good idea to test it out to avert a potential problem. The bike comes part assembled. It can be completed at home but it is more involved than most bikes probably because it is designed for commercial use rather than for domestic purposes. You are required to add the flywheel to the bike whereas most bikes sold for use in the home have this step completed. You do need to supply your own tools. They are a crow foot spanners, wrenches. Allen keys and torque wrench – many do assemble it successfully without using a torque wrench. In assembling the M series of bikes most people can do it within an hour or two. As well as adding the flywheel it includes adding stabilizer bars, pedals, adjustment posts, handlebars, seat and console. It has a reasonably good console and it has bluetooth to work with the Fitness App – GoInd App. You need a smart device that runs iOS 7.0 and above to use it. There isn’t an Andoroid version of the App. It is important to note that the console only works with the one App and you can’t upload your data to other Apps – which does annoy some users of the bike as they want to be able to upload to a more featured App than the GoInd App. The console displays RPM, power (watts), calories heart rate, elapsed time, gear (resistance level), odometer (total cycled to date for first 8 seconds, then current workout). Distance displayed on the bike is not miles or kilometers. But it is something in between according to the company. To have your heart rate displayed you need to be wearing a compatible polar and coded heart rate strap (per the quick start guide) that needs to be bought separately. The console is backlit so you can see the display and measures in all light conditions. This comes automatically when it senses the low light conditions. It is powered by 2 AA batteries and when they need replacing the console displays LO-BA in the odometer section at the bottom of the screen. You can place the bike where you want you’re not limited by a power cable and you can use if there is a power outage. The Trixter X-Bar adds an element of training can make it more like riding a bike where you can lean into the bends when you’re following a virtual cycling DVD. Although you can use it for cornering you can also move it from side to side as you stand on the pedals like you might do out of the saddle sprinting or going up the hill which will give you better training as well as burn more calories and work the upper body more than you normally get on an exercise bike. This helps with you being able to train and develop your upper body indoors like when doing steep hill climbs and sprinting which you don’t get on traditional spin bikes. The Trixter X-Bar has been developed by Trixter for use with their cycling bike where you wear you can one of those virtual helmets or program or workout classes. Looks like fun. But you don’t get one of those with this bike nor programs to follow. Those need to be consdered separately. There are 7 levels of resistance controlled by the tension knob at the right side of the X-bars. You adjust this once you are out of the saddle to the level you want going from easy to hard with beginners starting at the lowest level. Apart from the handlebars which are an integral part of the bike the only other accessory is a water bottle holder at the bottom of the frame. You rest the bottle in place which does it make it easy to grab and return – you don’t have try to slide it into a holder. You may find that you drip sweat on to the bottle which could make it slippery and a little “gross.” Also when getting on and off the bike in particular if you step through the bike you may catch your foot on it sending you or the bottle flying. Due to the bike being newly released there are no customer reviews to see how the bike is performing. Other bikes in the Keiser M3 range have very good ratings and there is no reason to believe this one should be any different as the only difference is the X-Cross Handlebars – everything else is the same. Keiser M3i which has 91% of customers rating it a 4 or 5. It is an expensive bike and about $500 or more than the Keiser M3i. You are getting a very highly rated premium indoor cycle base that has stood up to the use and abuse from being in clubs across the country. It has a number of premium features including the pivoting X-bars (which is the big premium extra), belt drive, magnetic resistance and console. When I checked at Amazon it qualified for free shipping. Click here to check latest pricing and availability. The Keiser M3X has all the benefits of a traditional spin bike or indoor cycle with the added feature of moving handlebars for more realistic cornering and upper body workouts. You can use it to get a standard spin bike workout if you want. And it does give you that. But it is the combination of that with the ability to roll the handlebars that allows you to corner, use it like a trail bike or mountain bike and engage the core, torso and arms in a way that isn’t possible on a traditional spin bike. As well as giving you that additional movement for training it helps in developing the upper body more and burn calories for more overall fitness and conditioning. It does come at a price and some won’t like the magnetic resistance, belt drive and flywheel. That aside, for the rest it’s a great way to get bike like training and conditioning workouts indoors.